My dear friend @DharmaApple from Edge Meditation Calgary and I have been discussing focus. It's a long story (for both of us) as to what led us to this idea, and I recommend reading her post about her need for it. For my part, I was listening to an Against The Stream PodCast by Noah Levine about The Seventh Factor of Awakening. Some of the things he was saying about Mindfulness, and about sticking with practices for long periods really struck a chord with me. I started focusing on some of this that day. Meanwhile, Kayla (@DharmaApple) posted about feeling scattered. All of these, and other things, were swirling around our heads and an idea formed. When we discussed it, we decided to try something out. 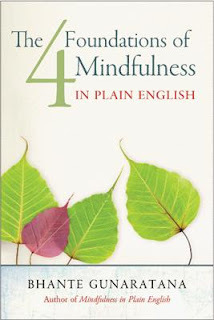 Four Months of Dedicated Practice on The Four Foundations of Mindfulness. Starting on October 1st, One Foundation per Month for four months. Read only the section pertaining to that month of practice from The Four Foundations of Mindfulness in Plain English by Bhante Gunaratana. Devote your sitting meditation to only that ONE practice for that Month of Practice. No expectations (other than to devote to this practice) and just see how it goes! Our hope is that this structured, dedicated practice of the basics will help us sort of free up from whatever habits we've gotten in to with our practice of trying to force things, or expectations of results. Also, it's just a nice exploration of longer periods of dedicated practice. It's a small time frame (in terms of dedicated practice), and will give us a taste of a longer such times. Ultimately, for me, I'm viewing it as a reboot of my sitting. We'd love to have you join us! Please let me know if I can assist. So tell me, who aren't you? So, as I continue to publish my thoughts, efforts and experimentation with Phillip Moffitt's "From Emotional Chaos to Clarity" book (as part of the Buddha Book Club) here, I'm now covering the exercises at the end of Chapter 2 - "Getting To Know The Real You". "Your movement from emotional chaos to clarity begins with answering the question, "Who am I?" The fundamental point here is, I think, that most people go through life without any real understanding that "The mind" is not "themselves". With a daily meditation practice, we start to notice that the mind is, indeed, not who we are. As we meditate, we gain a spaciousness from our thoughts. This space gives us the ability to understand that our thoughts don't have to rule our behavior. For many people, especially anyone with some form of addiction, this realization can be life altering. It can be the first time this idea was ever thought possible! To do the exercise in Chapter Two of FEC2C (From Emotional Chaos to Clarity), Mr. Moffitt asks us to spend time reflecting, not on who we are but, on who we are not! One word of caution here...this is, as he states in the book, not a one time thing. This is a practice you want to incorporate in to your daily life. Essentially it should become part of your overall practice. A good tool to check in with on an ongoing basis, I think. "The following suggestions can help you cease being trapped in a false identity and begin to open up to new possibilities." I will post short versions of the exercises and some thoughts here, but I encourage you to read them at length in the book and practice them as such. Which type of "mistaken identity" best describes the way you tend to think? (referring to several types of behavior he reviews in the chapter.) For me it was the "You are not your responsibilities and habits" type. He talks about how "You can fall quite literally in to believing your identity is the sum of your duties and habits." Any parent out there probably has some experience with this. I can easily find myself living a routine and mundane daily set of tasks. I have to make an effort not to. So I definitely identified with this. The old cliche "Variety is the spice of life." takes on a whole new meaning when you get stuck in this mindset! Which type has caused you the most suffering in the past? For me it was "You are not your history." He says "Your history is simply an accumulation of actions and events that characterizes you at a particular moment in your life; it does not define your essence." I used to, long ago, always blame my parents or other factors - but mostly my parents - for a lot of things in my life. I let go of that a long time ago, but it used to cause me a lot of suffering. Become a careful observer of your behavior and the mind states underlying that behavior. I've been trying to make an effort to do this more. We have a tendency, I think, to see a certain mind state and say to ourselves "aha! I am behaving like this!" and then we identify with that, say this is who we are, and move on. I think the goal here, or certainly a more skillful goal, is to remember that he says "be an OBSERVER" not a JUDGE! Don't use any judgement as you notice these things, and don't notice it once and consider that you are that observation. Just routinely observe, without judgement, these states of mind and be aware of it. Then do it again. And again. You get the picture. Begin to notice the difference between the experience you are having and your awareness of the experience. He gives the example of noticing that you are hungry, but shifting your attention from the feeling to the awareness of the feeling. Ask yourself how it is different. For me, this was a good example because my issues tend to be around food. Not so much anymore, but still an area of interest for me. So, using that exact example, I noticed that when I identify with "feeling" hungry I'm anxious and sort of driven to act. When I shift to the awareness of that feeling, the drive seems to recede and eventually the feeling passes. When I observed this often enough, I started to notice (and I've been doing this for a couple of years now, so it was much easier for me I think) that often the "feeling" of hunger is just a thought that sets off a chain of other thoughts that imitate a true feeling of hunger. In other words, my mind says "Man, some dark chocolate would be good right now, with my coffee." and then there is this cascade of thoughts that happens very rapidly, almost undetectably. "Oooh that sounds great. I love dark chocolate with coffee. What time is it? Two more hours to lunch. How many calories have I had today? Is it raining? No. Good. I can walk tonight. That means I can walk extra and burn off some more calories. That means I could eat that dark chocolate if I wanted to. I don't need it. I do want it. I'm gonna have it. Nah, I won't. Man, I'm REALLY hungry though." and on and on. Somewhere in there, it's as though the collection of thoughts is dropped in to a bucket that adds up to a single over-riding thought of "I'M HUNGRY". If I shift from that to just observing that, then I start to see it riding off in to the sunset, very slowly, and I start to notice, I'm really NOT hungry. I'm fine. THAT, I think, is the key to this exercise. Shifting from believing whatever your mind tells you, to letting it believe whatever it wants, while you wave goodbye to it and go about your day. The example I gave above was a lot longer than I meant to make it, and it also kind of covers the rest of the exercise in chapter two, so I'll let it go at that. This is a sampling of my work with chapter two, and I hope to hear from some of you as to your experiences with it.